LG bailed on the tablet market after the amazing flop that was the G-Slate, but came back to the table last year with the surprisingly competitive G Pad 8.3. It became the first Google Play Experience tablet, and now LG is expanding its offerings with 7, 8, and 10.1-inch devices. Guess what we don't know about these devices... pretty much everything else. The three tablets will be completely unveiled at the MedPI 2014 show, running May 13-16th. That's a few weeks before the expected G3 announcement on May 27th. It looks like the company isn't dropping any hints with the press images for the new G Pads, either. Note the lack of UI other than the generic battery icon and the clock. You can expect these devices to include LG's usual array of software tweaks, like Knock Code, which is heavily cited in the PR. 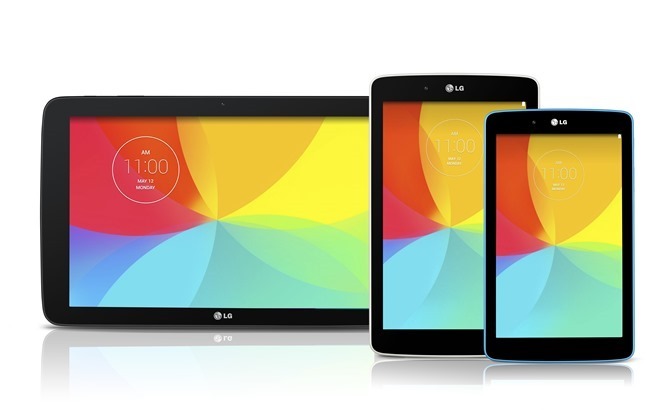 LG probably isn't going for a multi-tiered tablet lineup a la Samsung, so I'd expect these new devices to at least be solidly mid-range. Looks like there will be some fun colors, though. We'll have to wait to find out. Full PR is below. ● G Pad 8.0: With its 8-inch display, LG’s mid-sized tablet offers an immersive multimedia experience andsmooth multitasking.